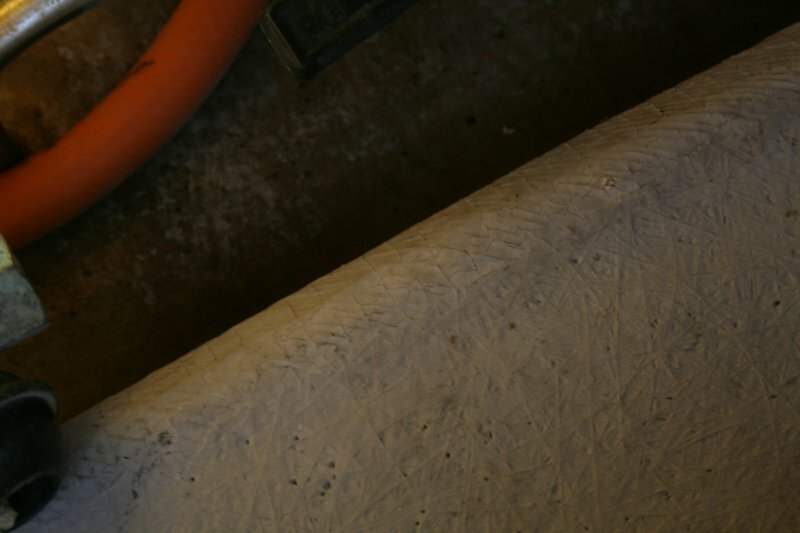 This post missed the insertion into the blog – it was supposed to go live 4/7 so it is reeally behind. Bocas del Toro are in the Atlantic side, part of Panama…but still a good post. 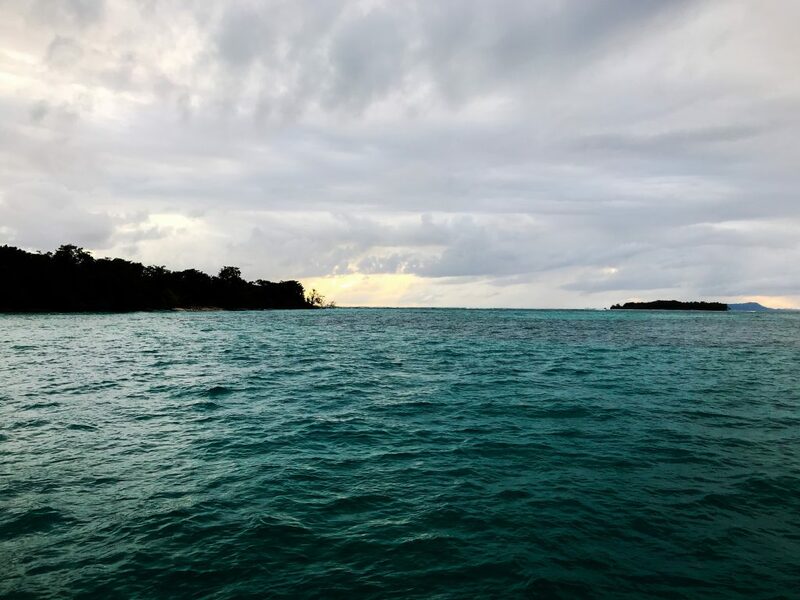 We completed our work in Shelter Bay and decided to sail to Bocas del Toro. 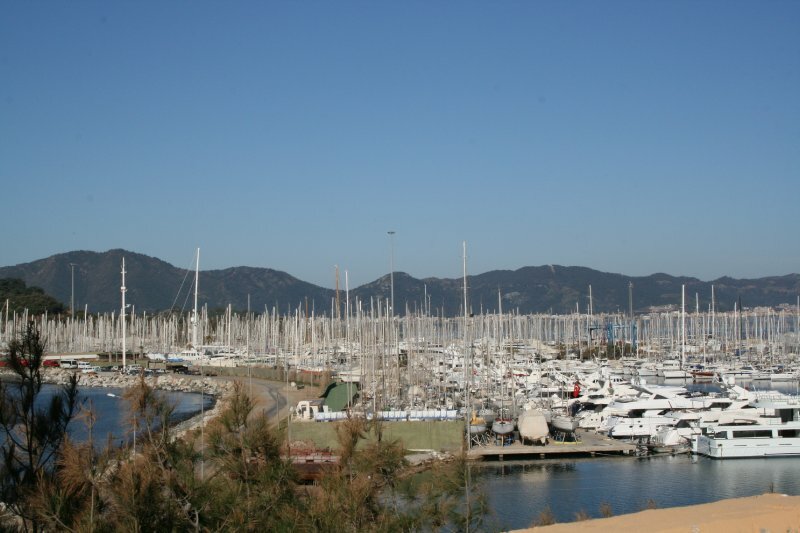 Since we have three weeks before our transit date it does not make sense to spend that time in the marina (even though it is really nice) when we can spend it exploring new islands. Bocas del Toro is a province of Panama comprising many islands off the Caribbean coast and just 30 miles from Costa Rican border. Christopher Columbus discovered this area on his 4th and final voyage in 1502 and was anchored in the same bay that Sugar Shack dropped the hook. In the 19th century, several people migrated here bringing their slaves to avoid taxes including the Scottish, English, Knapp’s from Jamaica, and the Shepherd family. 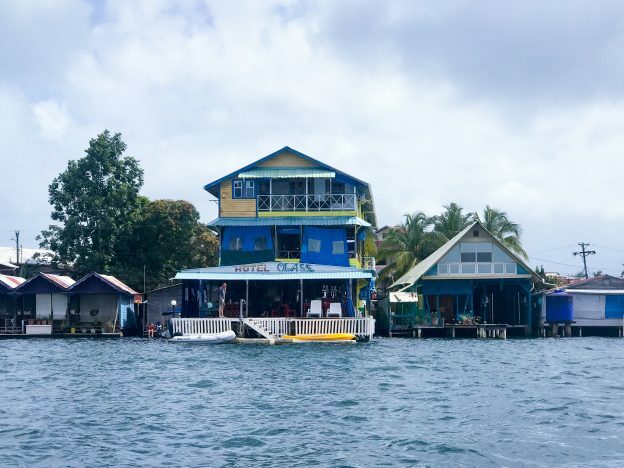 For more history on the Bocas, visit this site. 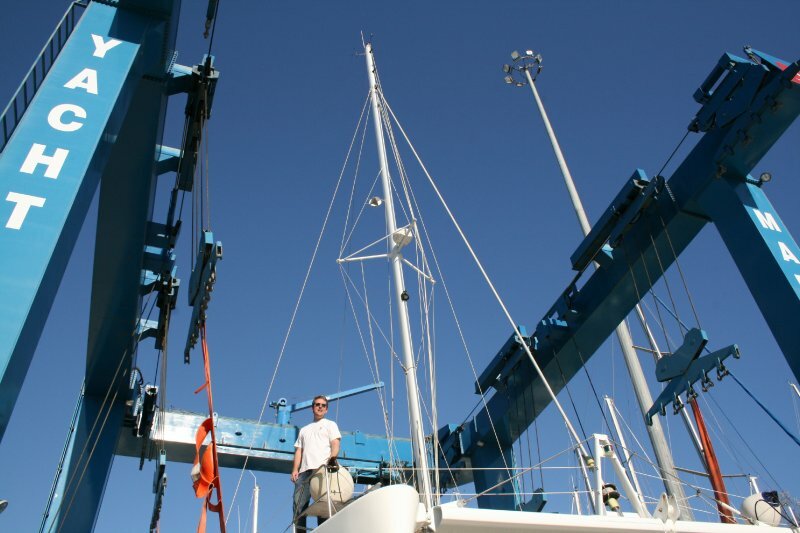 With Matt at the helm, we left the marina as I started to stow our lines and fenders. 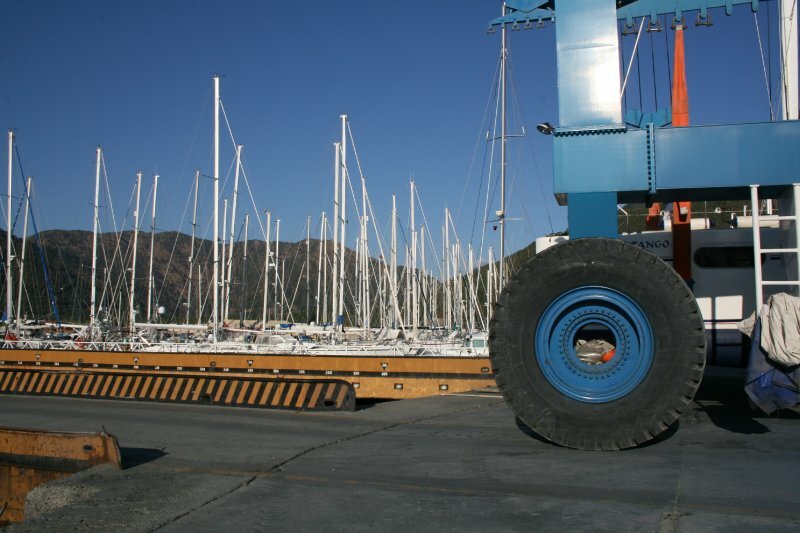 We had (4) lines holding us to the dock and 4 of our large A4 ball fenders and 8 of our F4 tube fenders. I wanted to stow them before they got wet, not such a good idea. Heading out of the marina into the breakwater, between the “explosive anchor markers” and the sea wall was like being in a washing machine. The seas were coming from every direction, the wind was howling, the boat was banging on each wave causing huge splashes. And where am I? At the bow, on the tramp, holding on to the netting with one hand, and the fenders with the other. Not my brightest moment. I returned to the cockpit soaked to the bone as Matt said “how was your bath?” Not the way I anticipated starting this voyage, but the fenders are all stowed. The forecast showed good winds for our passage, but they were going to die down over the next few days. 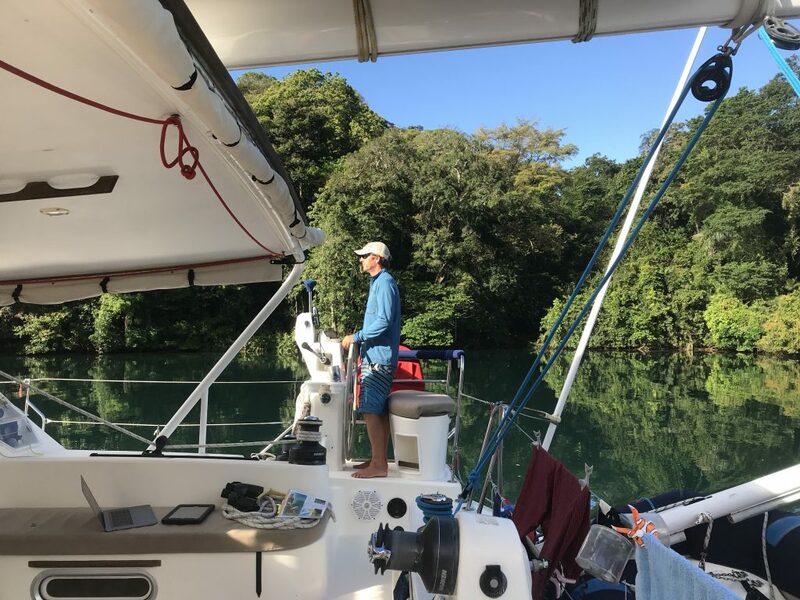 We set the main and jib with one reef, after the hour it took us to get out of the marina, motor 3 miles out of the channel, and clear the breakwater. It was a great, fast sail in the beginning, we had 18-25 knots of wind, 2 meter waves and an average speed of 7.5 knots. With our good wind and the prospect of no wind over the next few days we decided to skip Rio Chagres and do that on the way back to Colon. At dusk, the wind started to slow down so we shook out the jib and carried on as night descended upon us. Matt made dinner and as I cleaned up he took the first night shift 2000-2300. The winds slowed down considerably and he brought the jib in. On my shift Matt only slept for about 30-40 minutes before waking up again. 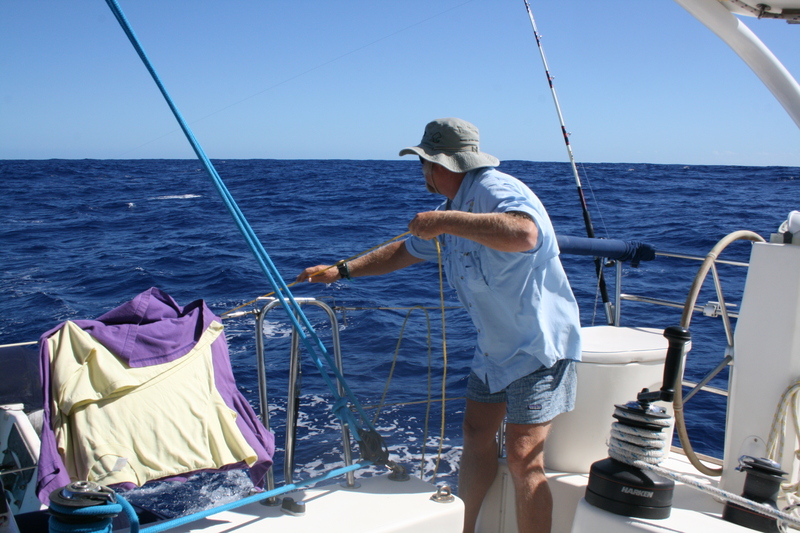 The winds had shifted and were now on our nose making our main sail useless so we brought that down as well. Motoring along at 2,000 RPM, head into the wind we should be making 5 knots. But wait, we weren’t! Off the peak and down a wave we would average 3-5 knots, but in the trough and up the wave we would average 1-3 knots. It was pitch black at night and we could not see what was causing us to slow down so much. Sure, the waves were big, but 1-3 knots, come on? 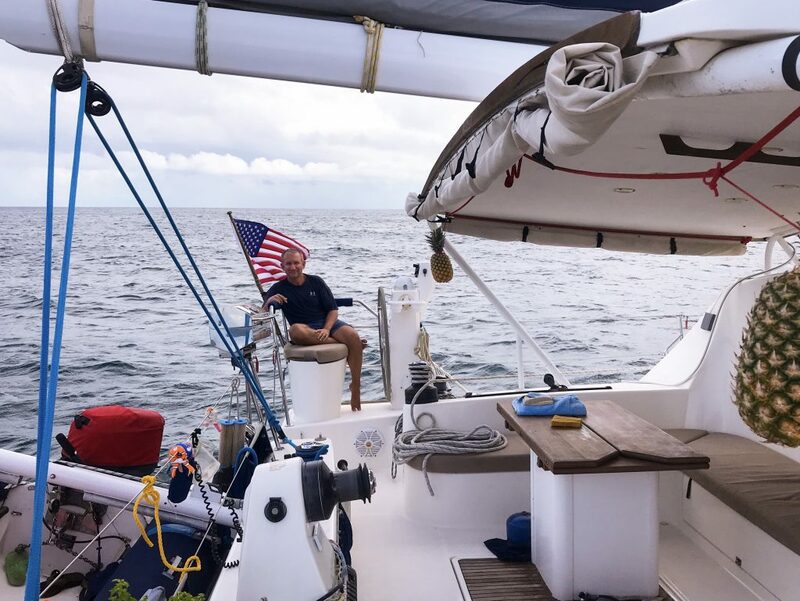 Around 0400 Matt checked the pilot charts and realized that we were in a strong easterly current that was pushing us in the opposite direction we wanted to go (it was in cahoots with the wind). 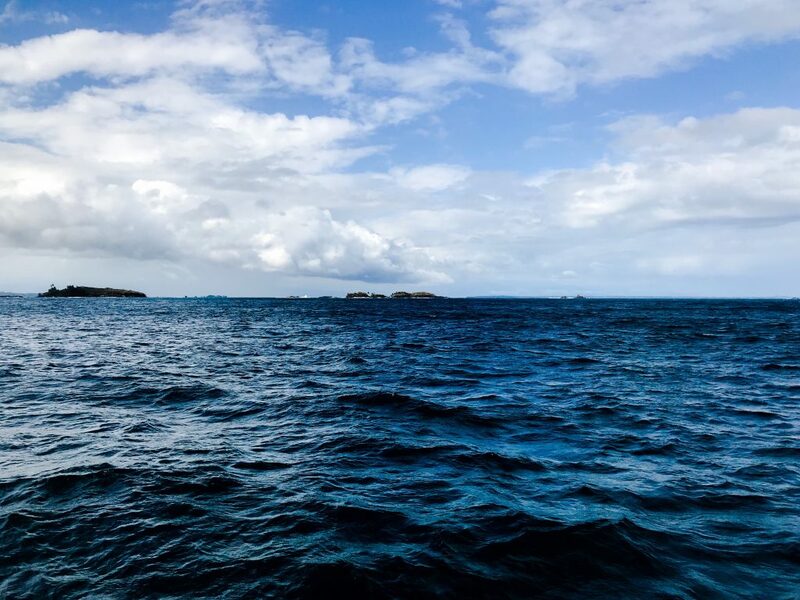 We arrived to the Bocas del Toro channel around 1430 and what a welcome site it was. Several islands surround the Bahia Almirante, including: Isla Colon, Bocas Town, Cayo Bastimentos, Cayo Nancy, and Isla Christobal. 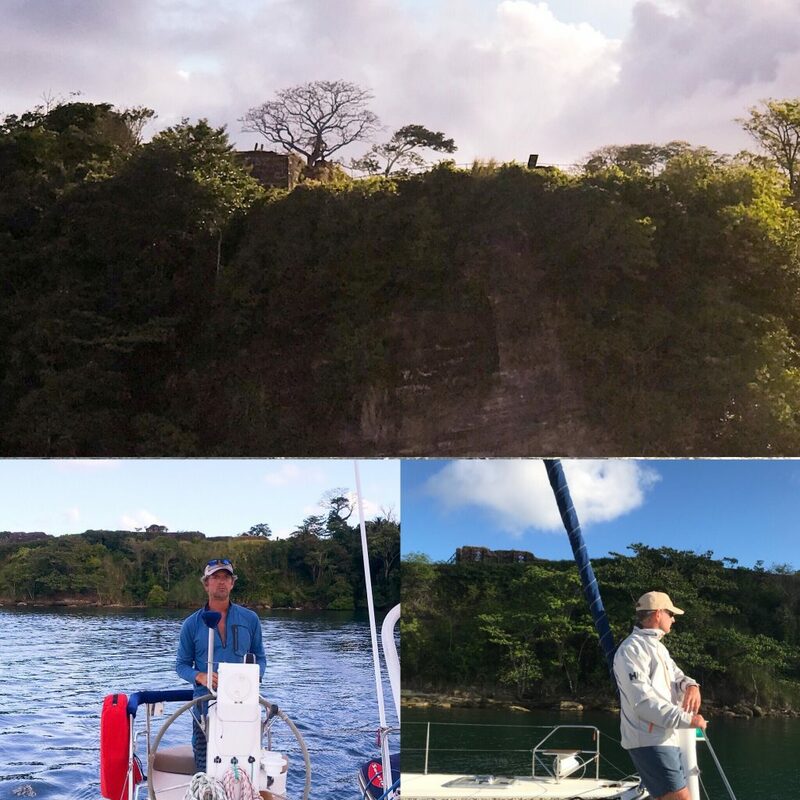 Our friends on “Wandering Rose” were anchored on the southern tip of Bocas Town so we motored around the huge reef and anchored our ship. 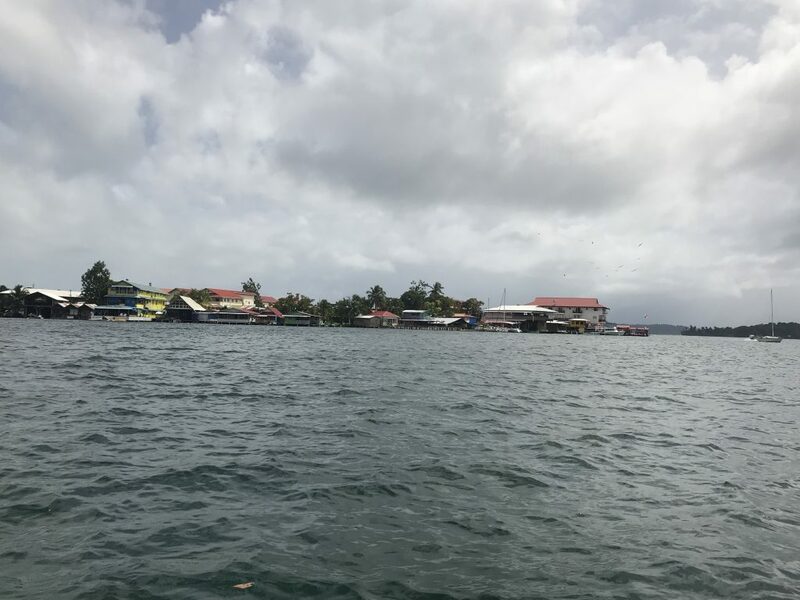 Bocas del Toro Town, or just Bocas Town is at the southern tip of Isla Colón, in the Caribbean Sea. Bars and restaurants fill the waterfront making for a colorful photo. We were exhausted, but felt the need to go ashore and explore. The dinghy dock at Hotel Olas was pretty easy to find as the hotel is a bright yellow. Our friends Dave and Mary, “Wandering Rose” were there interneting away. They gave us a few tips about the island before we set out to explore. It was close to 1800, the sun was setting, on a Sunday during carnival. We did not expect to see many stores open, but we were surprised. The town was starting to stir, locals were putting on costumes, and music was blaring, as we explored the small town. We did not stay out long as we were hungry and tired. Hotel Olas with dinghy dock out front, $2 beer and decent wifi. 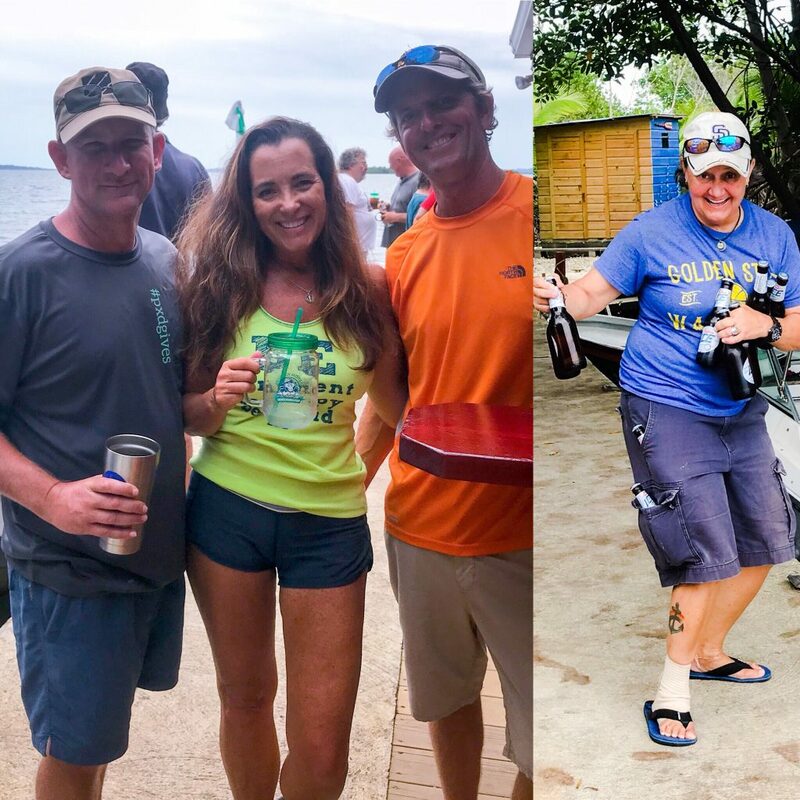 This entry was posted in Panama Atlantic and tagged almirante bay, bahia almirante, bocas del toro, bocas town, catamaran, catana, chagres river, costa rica, hotel olas, islands, living on a boat, living the dream, panama, rio chagres, sailing, sugar shack, women who sail on May 5, 2018 by Christine. Sugar Shack is on the move again. It’s time to make the passage from Bocas del Toro to Colon. After Monday Market at the Drunken Monkey, we headed to the Zapatilla Cays. The fastest way to Zapatilla is 10 miles southeast through the Crawl Cay channel which runs between Isla Batimentos and Isla Popa. The only problem is that it is not the easiest route to take. There is a high proliferation of coral shoals that require good light and polarized glasses. Thank goodness the sun was high in the sky and no rain was in sight. We made a few “about faces” and decided to “abort” a few routes, but we made it out safe and sound. A few hours later, we arrived to the twin islands. We decided to anchor at Zapatilla Cay Numero 1. The other island is aptly named Zapatilla Cay Numero 2. Both islands are a part of the Bastimentos National Park. We were all up early, so we readied the boat for departure and made our way toward our next destination, Escudo de Veraguas. This is a 32-mile journey that should take us about 5-6 hours. The wind was acting wonky so we only rolled out the jib. With no wind instruments we didn’t know the wind speed and we only knew the direction by sticking our face in the wind. The waves were rolly and at about 2 meters, but they were several seconds apart so it was not terribly uncomfortable. 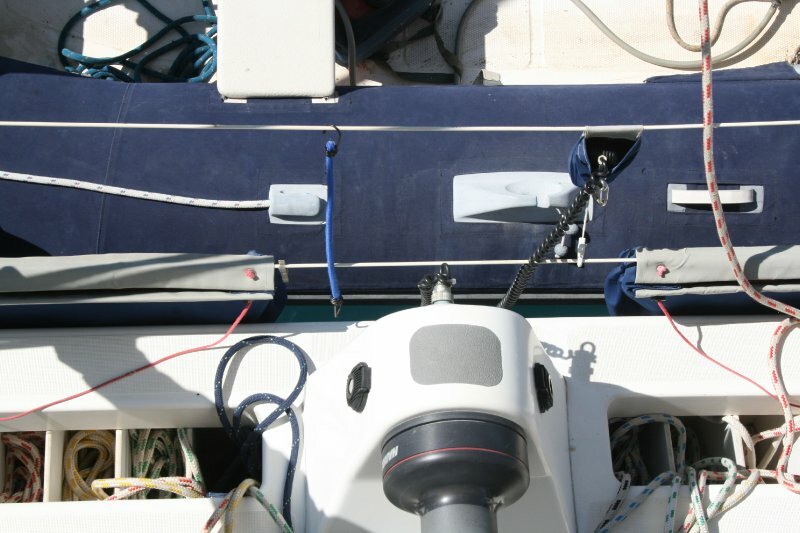 We did have a 1-2 knot current which helped push us along our path and gave us better speed. Overall our trip took 5 hours with an average speed of 6.1 and a max speed of 8.8 (down a wave). Not much to do on this passage, but watch the depth, adjust the sail, and enjoy the ride. On the way, we passed by Cayos Tigre and Tiger Rock which make a big impression as you pass by – thank goodness we are passing by as one would not want to get too close. Its hard to tell from the photo, but there are three protruding rocks in this set of Cays. For some reason it made me think of Eagle Rock where my mom grew up. Escudo de Veraguas has rich waters all around the island. 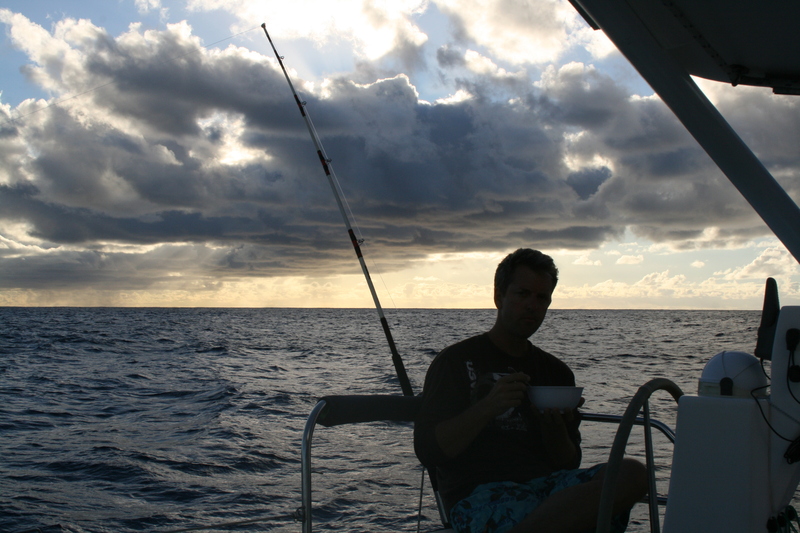 Many fishermen come from the mainland to fish and skin dive. There are two anchorages on this island, but some friends recommended the southern anchorage so that is where we dropped our hook. Image: Left a set of sea caves, top right is a large sea cave with a sandy beach, middle, sandy beach but too hard to approach with the surf, bottom more sea caves. We had hoped to go snorkeling and or exploring on shore, but the dreary rain kept us on the boat. It finally cleared around 1700 so we hopped in Sweetie to go check out the massive sea caves. This island is pretty remarkable with drastically different landscape. At one side of the island there is a beach and the other side has huge cliffs with little inlets. Keep in mind that these two landscapes are on the same side of the island, just different ends. It was a very rolly anchorage making it uncomfortable to stay more than one night. 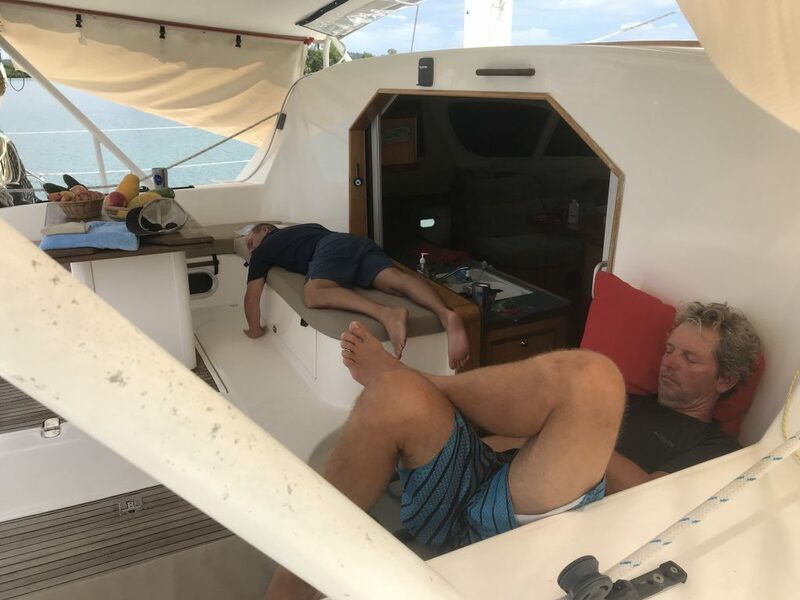 We had hoped to remain here for a few nights to clean the hulls and waterline and install the new wind index but the weather conditions made it too unpleasant. So, we left the next day and headed to a very small anchorage called Euero. 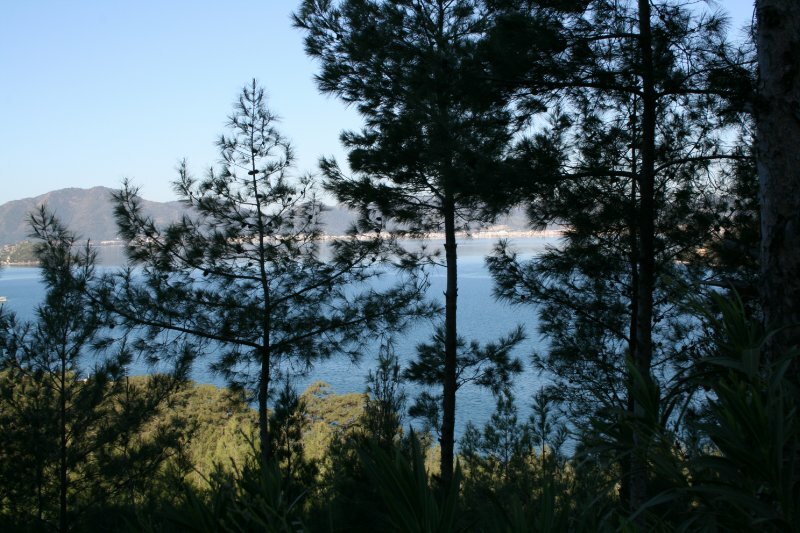 Euero is a 46 mile passage from Escudo de Veragas. The good thing about this weird weather pattern is that the waves were actually going with us rather than against us. We ended up motor sailing most of the way and arrived around 1600. The anchorage is supposed to be one of the calmest anchorages along the coast. However, with the northerly winds it was like being inside a washing machine. 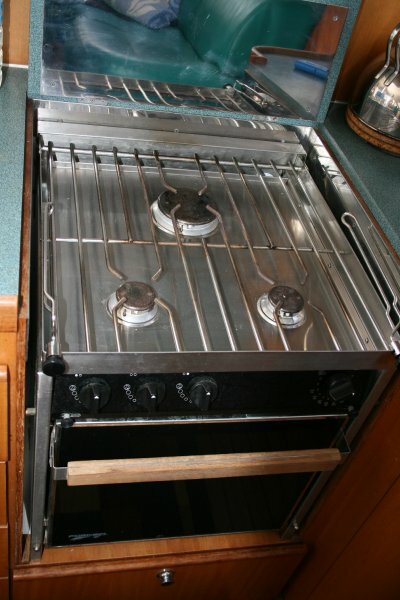 We tooled around trying to see if we could make it work, but decided it was not worth it. 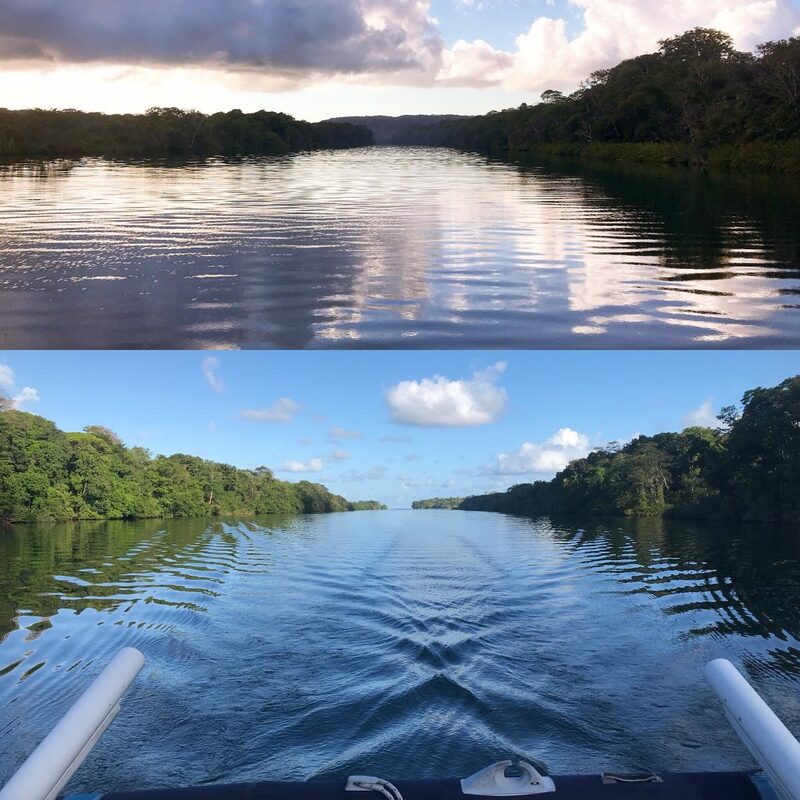 Even though we just spent 7.5 hours on the water, we decided to continue on to Rio Chagres, another 90 miles (or 15 hours). Will be a long passage and longer day. No matter how we did the math, we were going to arrive in the middle of the night and that is not good. The entrance to Rio Chagres is challenging enough during the day so we were going to have to figure something out along the way. Matt took the first shift from 1900-2100, then Wayne took the next shift 2100-0100 and I came up at 0100. 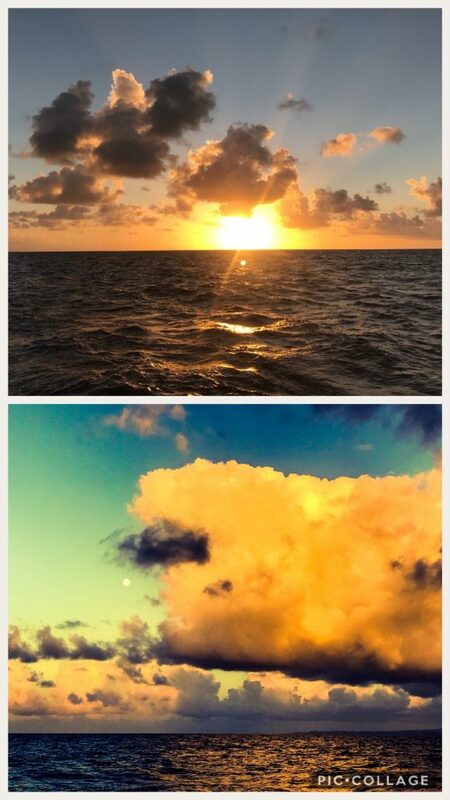 We were blessed with a gorgeous sunset and moon rise. I tweaked the moon photo too much, but I think it is still pretty. By the time my shift came around, we had a new plan. We were only 10 miles from the entrance and needed to dilly dally for the next 6 hours until the sun came up. We had no sails up and shut down the port engine to slow us down. So, for 3 hours, with one engine, I hand steered trying to maintain a heading of 45-50 degrees. The general idea was to keep the boat heading in the right direction without too much propulsion. Not a difficult task, but one that you had to remain vigilant at because Auto could not hold course with one engine, crazy winds, and rogue waves. The wind and waves constantly wanted to make the boat head up. And you could not cross the wind line without doing a full 360. It also meant you could not walk around, get food or water as you had to man the helm. Lucky for me, Matt was up periodically and fetched me stuff to keep me awake. 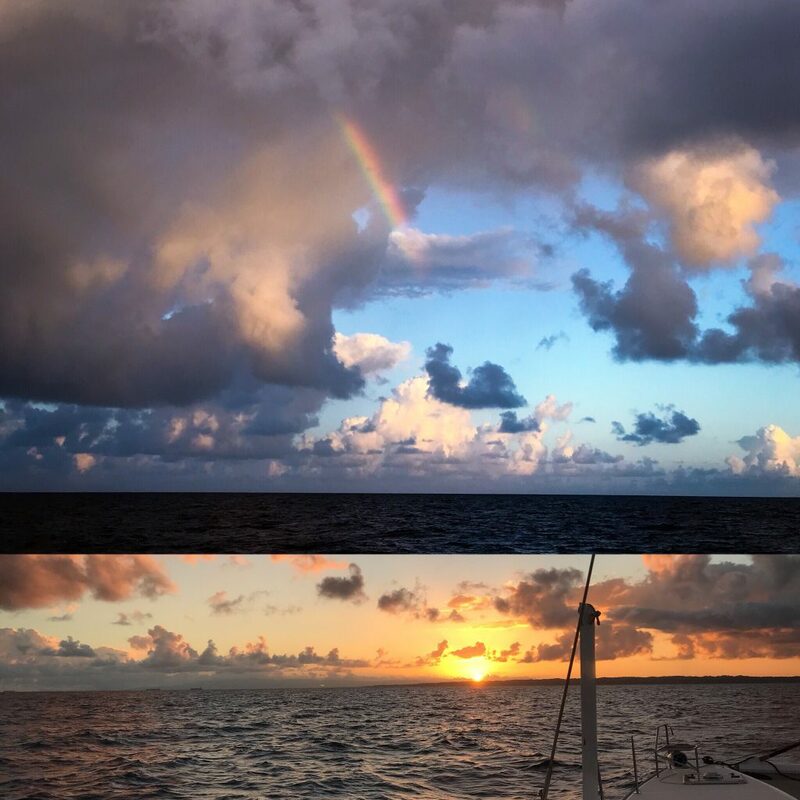 After my shift, Matt continued on the same path for another 3 hours until the beautiful sunrise and a small rainbow. Sunrise and Rainbow under passage. We finally arrived to the entrance around 0700 after killing over 5 hours doing 1 knot. Sounds thrilling right? As you approach the river mouth, the old Fort San Lorenzo beckons you to look up as it sits majestically a top of the hill. The entrance is really shallow at 3 meters and tends to have a lot of sediment and a wee bit of current as well. You can see the fort behind the boys as we passed through the Rio Chagres entrance. Motoring up the river, Sugar Shack splits the water quietly. It is stunning here. 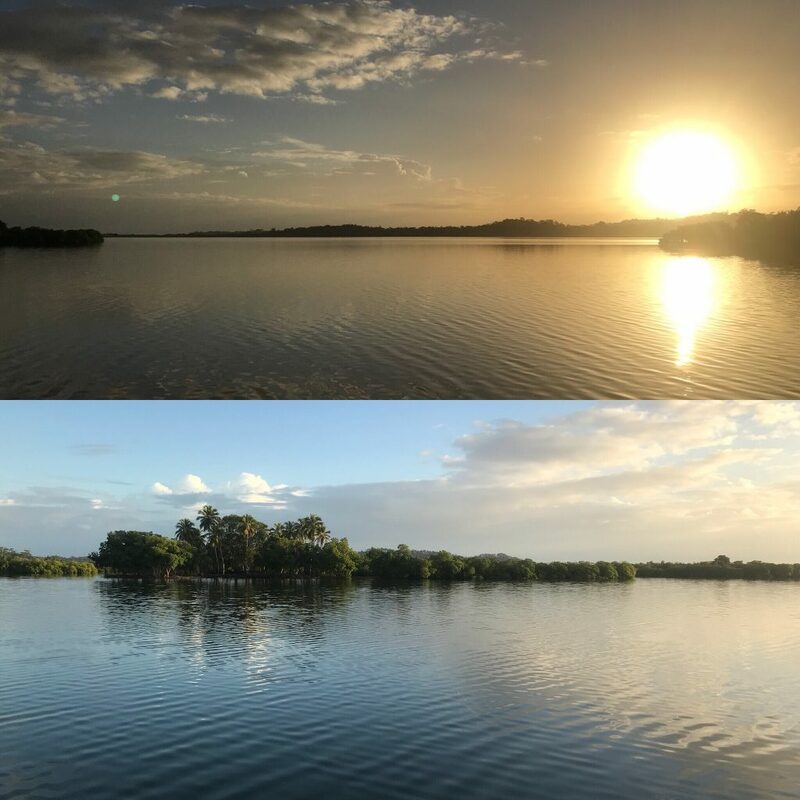 Top image is river before us, bottom is river after we passed by. The Rio Chagres is a stunning tropical, fresh water river that is surrounded by rain forest. Many believe this is a magical and mystical place that begs for silence which is only broken by the cries of the wild. After staying here for 2 nights, I have to agree completely. The Rio Chagres is protected and heavily researched. The Smithsonian Tropical Research Institute maintains an active research presence and all of the wildlife in this area are protected. The trees form a majestic 50-meter high canopy that starts right at the rivers banks. Further up the river, we found our own piece of paradise on the Rio Chagres. We anchored, ate breakfast, and hopped in Sweetie for an adventure. You can actually take your big boat all the way to Lake Gatun Dam, but we decided to go by dinghy. There is absolute solitude on the river. 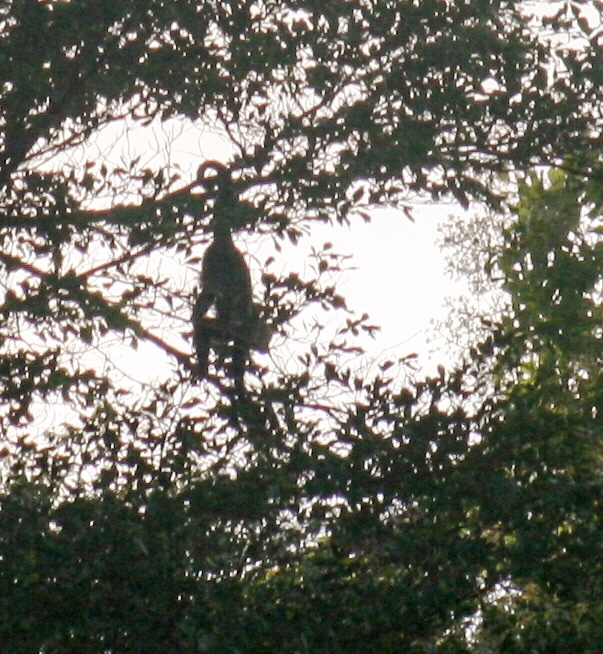 The silence is only broken by the sound of our 25hp outboard and the howler monkeys and birds. We made the short passage to the dam which was certainly a wonderful sight to behold – especially knowing we will be on the other side in a week. 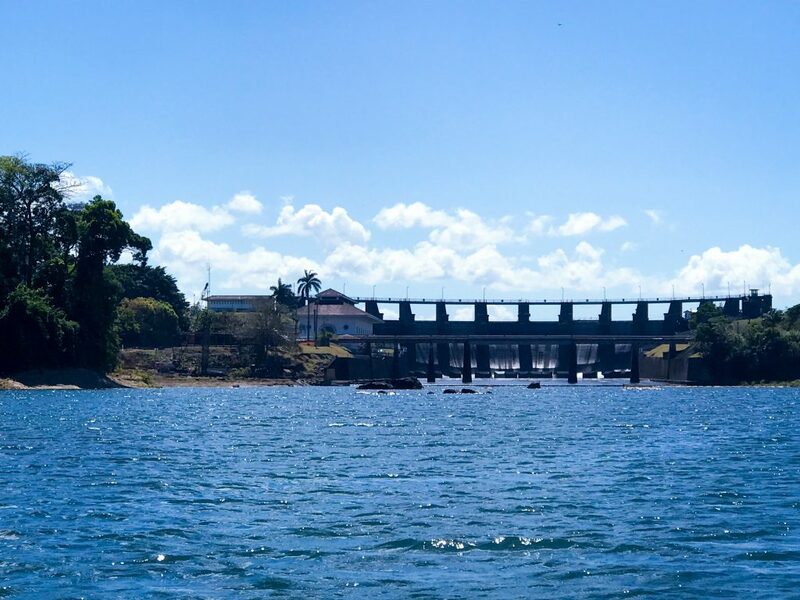 This river was dammed in 1910 to create the Gatun Lake and supplies the water for the Panama Canal. 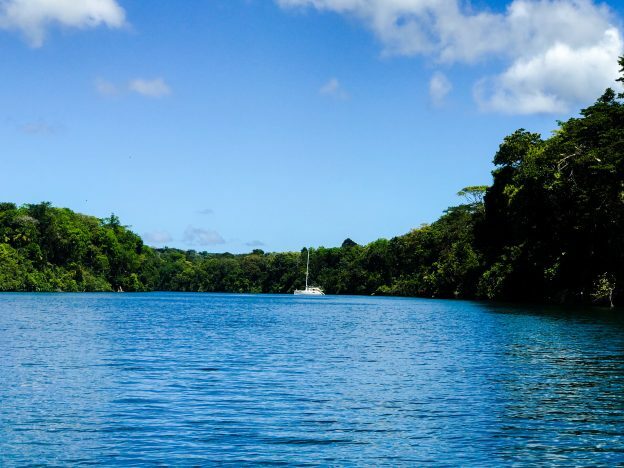 A boat can actually navigate 6 miles up the river all the way to Gatun Lake damn. Many of the earlier pioneers used this passage before the Panama railway was built. There is a lot of wildlife in the area, so we stopped, shut the outboard down and enjoyed the music of the animals. 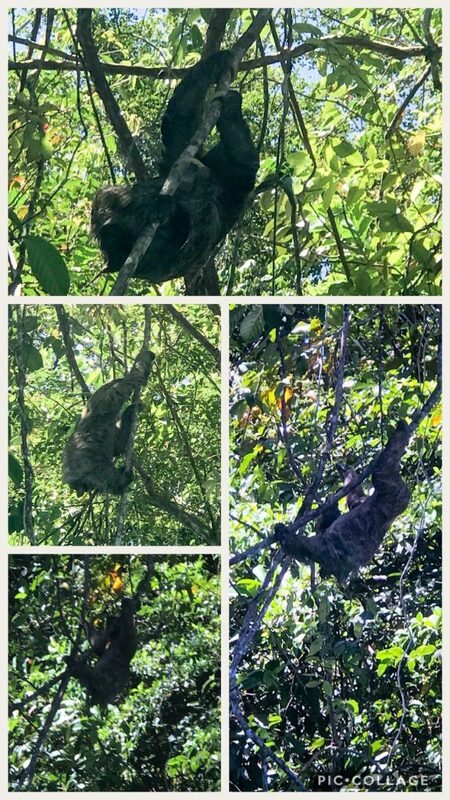 We did manage to see a sloth and several pretty birds. Sloth enjoying the cool water before a climb up a tree. The cries of the wild. Even though I move the camera, close your eyes and listen to the animals. Sugar Shack enjoying the Rio Chagres all by herself. We all slept well and hard after our broken sleep from the earlier passage. It was still and so quiet at night and as the sun rose, the forest came to life. Matt spotted monkeys in the trees next to us, so we hopped on the SUPs to introduce ourselves. They were shy, but we got a few good photos. We spent the next day being lazy, reading, and doing boat projects. Our last passage is the shortest, Rio Chagres to Shelter Bay Marina (SBM). Weave in and out of the huge cargo ships, into the Chrisobal Panama Canal entry, across the “explosive anchorage” and into a slip for a few days. 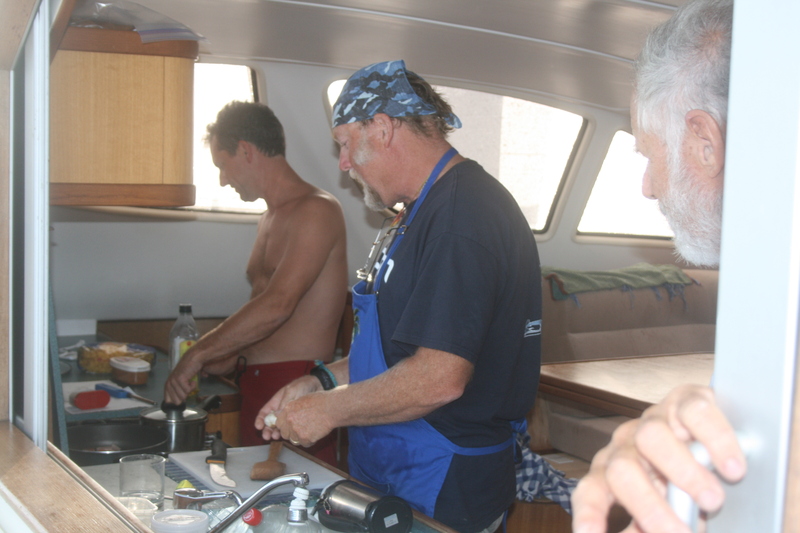 In SBM we will do a massive scrubbing of the exterior of the boat, prepare the port office cabin for Heather and Michael, prep several types of dough (pizza, bread, English muffins), provision, baking (cookies, brownies, muffins), and ready the boat for its passage through the Panama Canal. So excited!!! 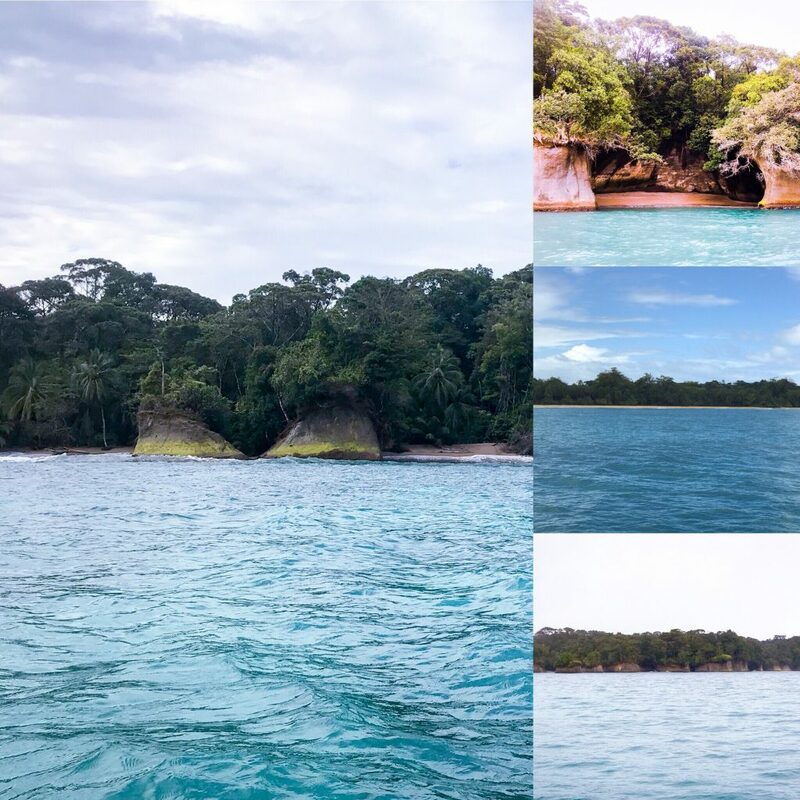 This entry was posted in Panama Atlantic and tagged bocas del toro, cruising, Escudo de Veraguas, euro, living on a boat, living the dream, moon rise, panama, passage, rio chagres, sailing, sea caves, sugar shack, sunrise, sunset on April 19, 2018 by Christine. Wayne arrived in Bocas Town after four airports and a crazy taxi ride, just in time for happy hour. 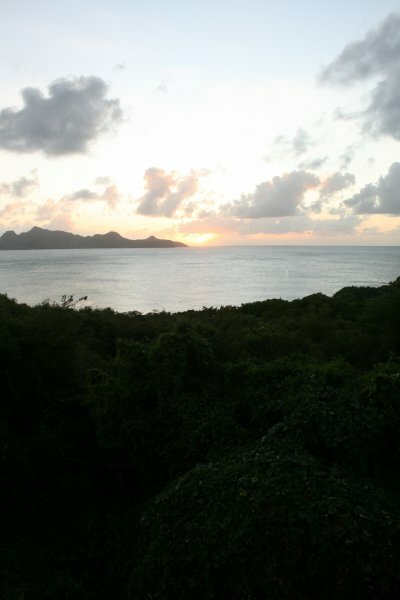 We whisked him to Buena Vista for drinks with “Wandering Rose” whom he had met in Bonaire. After a tasty dinner, we headed over to “Wandering Rose” for one last roadie and to say goodbye as this is where our sailing paths change course. Dave and Mary are heading to Cayman Islands, Cuba, then back to the States. Hopefully, our paths will cross again soon. 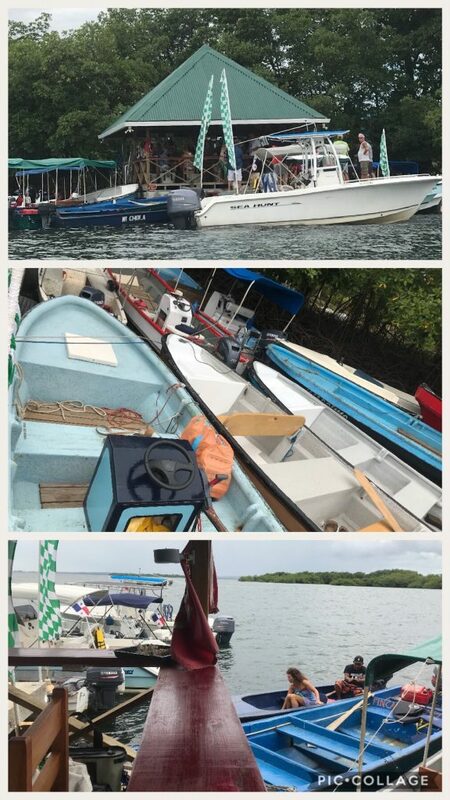 After we unpacked Wayne’s bags which were full of Sugar Shack parts and accessories, we headed to Bocas Marina to get fuel. We want to have full tanks before we transit the canal and this was a fairly easy fuel dock to tie up to. Sugar Shack took on 345 gallons which cost about $275, not bad. Then we added another $62 in gasoline for the dinghy and new generator. With the boat full of fuel, we made our way to Red Frog Marina’s anchorage off of Bastimentos. 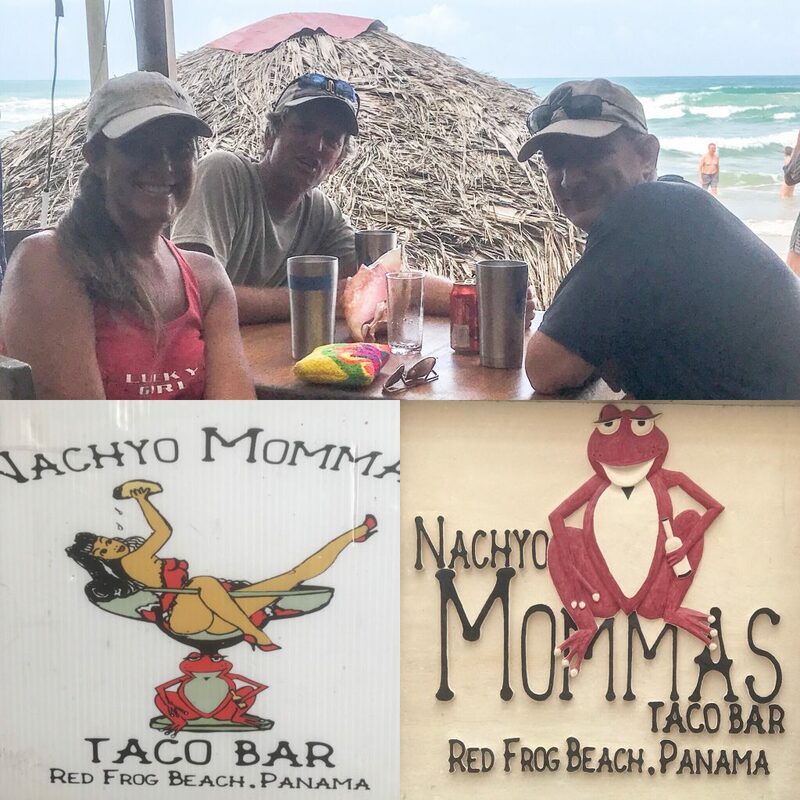 We wanted to show Wayne around the island, introduce him to the famous red frog. 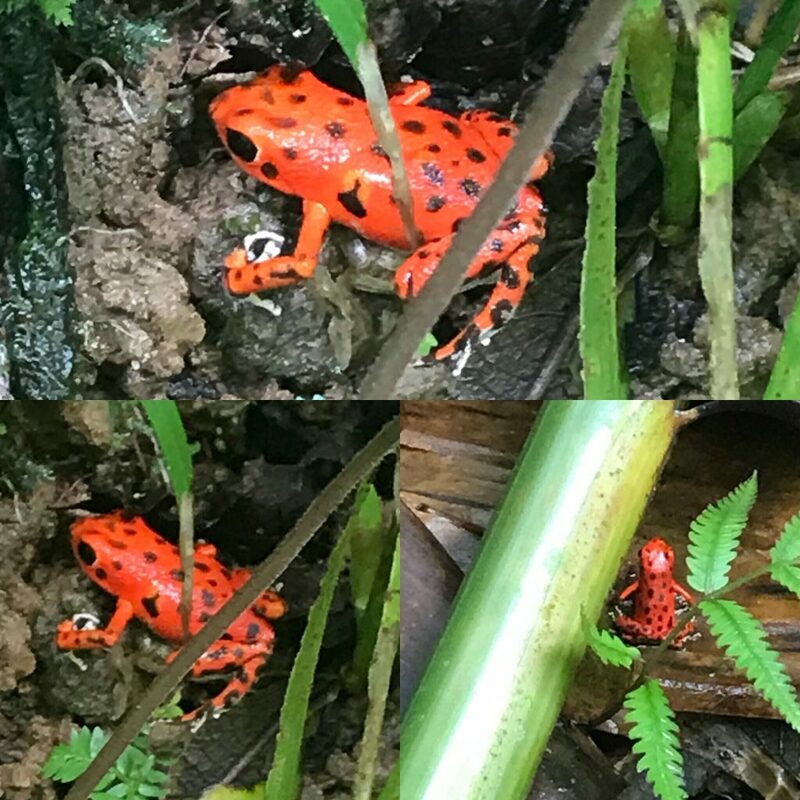 There is one place we know where they can be found and that is in the jungle by the Red Frog’s spa. One little guy came out to be famous. Last time we were here, we hung out at Palomar, but this time we dropped in on Nachyo Momma for a cold beverage. They are right next door to each other and share the same beach. We did not stay long as we wanted to travel down “the gap” to Dolphin Bay and over to the Dark Lands. It was much easier the second time around as we had our old track to navigate from. A beautiful journey through shallow water while surrounded by mangroves and reefs. Arriving just in time for sunset, we dropped the anchor and enjoyed a cool evening on board Sugar Shack. The boys went exploring in Sweetie while I showered and enjoyed some quiet time. 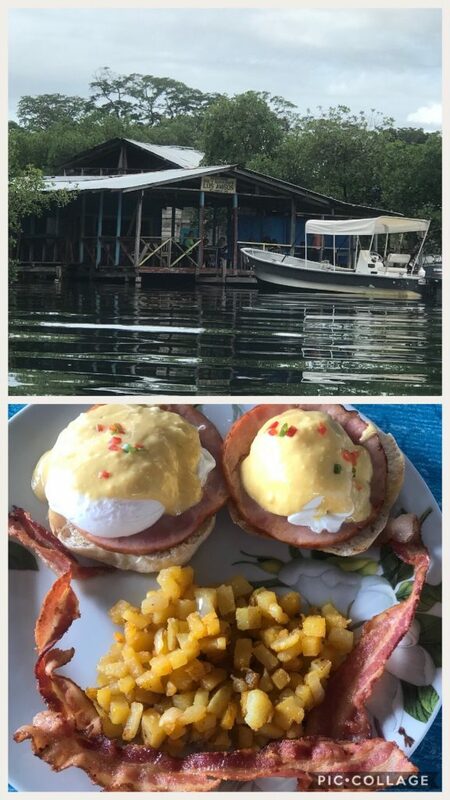 Los Amigos (or Ernie’s) is famous in the archipelago for its eggs benedict. We missed it last time we were in the area, so we made a point of attending with Wayne. When we arrived at 0900, the tables were full and he was in full swing. We sat near our friends, Rick and Judy from “Chasing Sunsets” (who live at Tranquillo Place) and enjoyed an absolutely mouthwatering meal! 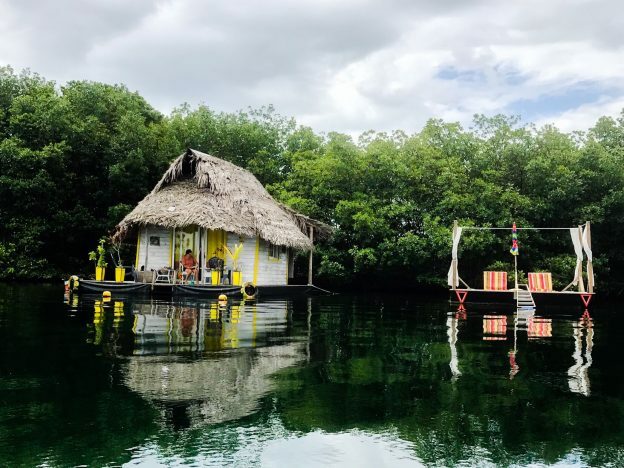 After breakfast, we explored the bay in Sweetie and found this cute floating house. We later learned that the current owners bought it for $60k and then spent additional funds on the floating sun deck. Locals were appalled that it cost so much (said it should have cost around $20k). It wasn’t long after we got back that the boys took a morning siesta. After all it had been a stressful day so far, eating breakfast with a few beers. Matt brought out a few water toys and we enjoyed the afternoon in the water. 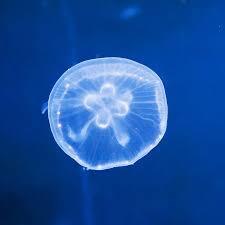 There are many “moon” jellies in the water, so I stayed on the SUP. Supposedly the moon jellies don’t sting, but they scared the crap out of me when they rubbed up against my leg. Since we had an early night, I was up early and was blessed with this gorgeous sunrise over Tranquillo Place. What kind of friends would we be if we did not take Wayne to Monday Market at the Drunken Monkey? Pretty crappy friends for sure. So, we planned our escapades around this event. We picked up Judy and headed over right when they open at 10am so we could get the best pick of the market. By noon, the Drunken Monkey was packed with lots of pangas. People park on either side and in front of it – where ever there is room. 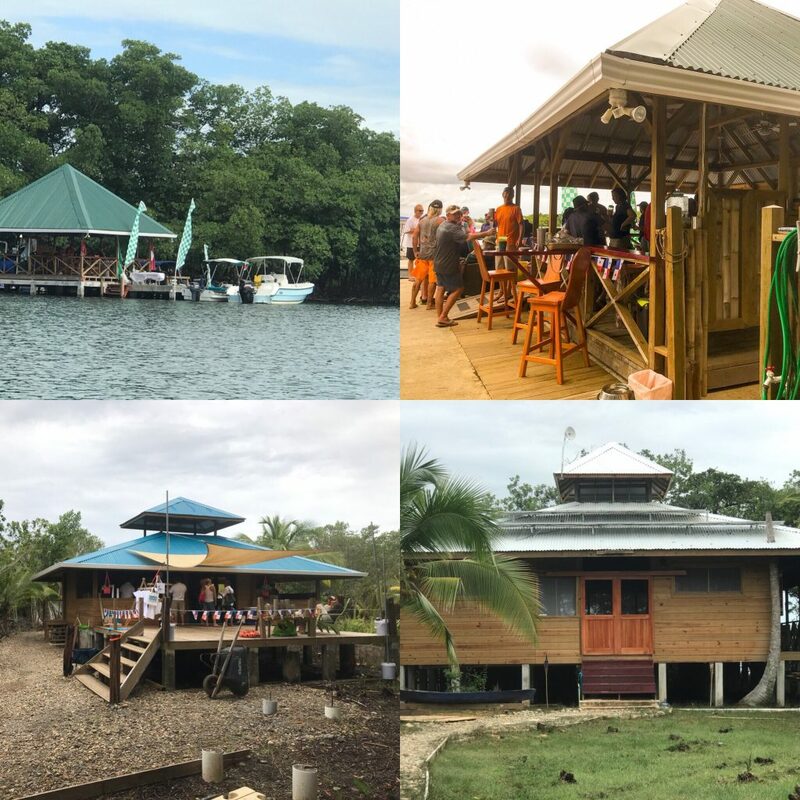 Image: Top left exterior of Drunken Monkey from the water; Top Right Drunken Monkey from shore; Bottom Left market area; Bottom Right Jessica and CJ’s home. Wayne, Matt and I enjoying good times at the Drunken Monkey and Jessica trying to juggle many beer bottles. 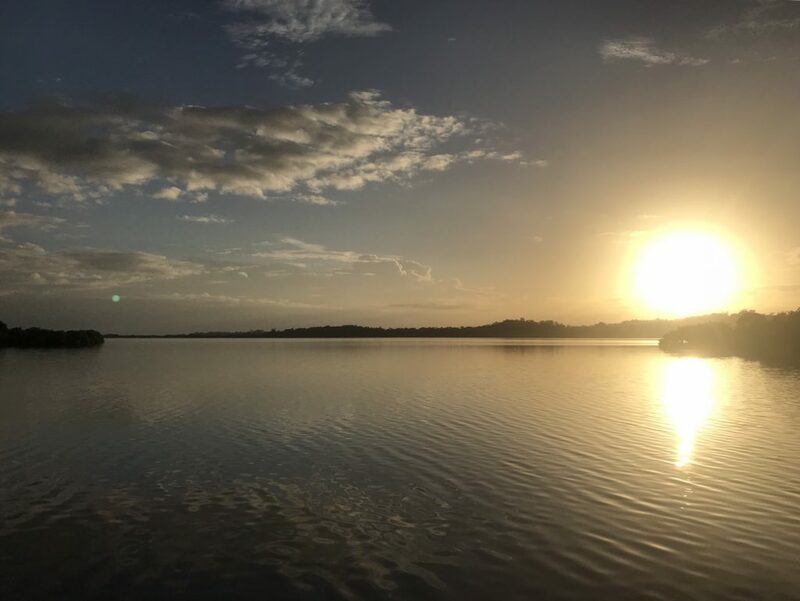 This entry was posted in Panama Atlantic and tagged bocas del toro, buena vista, chasing sunsets, cruising, drunken monkey, living on a boat, living the dream, los amigos, nachyo momma, panama, red frog, red frog marina, sailing, sugar shack, tranquillo place, wandering rose on April 17, 2018 by Christine.